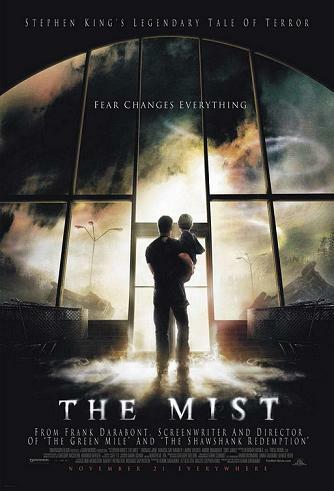 Frank Darabont writes and directs The Mist, a sci-fi/horror film about a group of small-town citizens trapped in a supermarket as they struggle to defend themselves against s variety deadly creatures while a strange mist surrounds the building. David Graydon (Thomas Jane) leads trapped employees and customers, such as a religious extremist (the scene-stealing Marcia Gay Harden), Amanda (Laurie Holden), Ollie (Toby Jones) and Brent (Andre Braugher). Based on the novella by Stephen King. Frank Darabont has previously directed The Majestic, The Green Mile, and, most famously, The Shawshank Redemption. He's expected to direct Fahrenheit 451. I had the privilege to interview him. MGM and Dimension Films release The Mist on November 21st, 2007. NYC MOVIE GURU: When did you first meet Stephen King? FD: I didn’t actually meet Stephen King until 1993 when I was scouting locations for The Shawshank Redemption. Up until then, from about 1980, it was more of a correspondence relationship. When we did meet, we became very good friends. NYC MOVIE GURU: Why did you choose to direct a sci-fi/horror movie? FD: I always loved the cinema or literature of the fantastic. Even at the age of 4, I wanted to see all the Universal monster movies on television. It’s nice to get back to my first love here. NYC MOVIE GURU: What are your favorite sci-fi or horror movies? FD: The original Night of the Living Dead is potent and The Exorcist is amazing. The movie that scared the hell out of me the most is Count Yorga, Vampire. I was 12 when I’d seen the movie. I suppose if I was 14, it wouldn’t have messed with my head. NYC MOVIE GURU: How did you balance the sci-fi/horror elements with the dramatic scenes? FD: The one that really dominates is the social, metaphorical [aspect]. The character study of people in the climate of fear and the pressure cooker of panic [are] what made the film very timely and relevant for me. Without being overtly political, it’s actually a rather political film. For me, the core of the movie was to make that, sort of, Lord of the Flies, Rod Serling outrage where the trappings of the genre are used to say something about the human condition. NYC MOVIE GURU: What did The Mist remind you of? FD: When I read The Mist, two things popped into my head: Lord of the Flies and The Lottery, which is one of the greatest American short stories. NYC MOVIE GURU: What do you gain from actually showing the creatures in the mist? FD: The mist and the creatures in the mist are merely a trigger or a context for telling a great story. What you gain is the fun of the creatures. When I first adapted the story and looked at the script, I felt that even if there were no monsters, the story would still work. The manic would still be at play. I didn’t want to leave the frosting off the cake. I wanted to have that layer of fun with the proceedings, so that it wouldn’t be such an overtly dour social commentary kind of movie. NYC MOVIE GURU: Did you use CGI for the creation of the mist? FD: Very few shots [of the mist] are actually CGI—only in the very beginning of the movie, on the lake and on the parking lot. The rest was all practical stuff. The one outside the market window was pumped into the soundstage with giant plastic tubes. He could fill about half of the stage with mist in about ten minutes. It was a very clever set of solutions, particularly in the loading dock where the [garage] door comes up a certain degree. It was very fun to be able to send someone out those doors and see them actually disappear without special effects. We stuck with a lot of old school techniques, which I get great satisfaction from. NYC MOVIE GURU: Why did you occasionally include silent scenes? FD: I really wanted a movie that depends on the silences between the words and the sounds as much as on the noises. It was a very interesting learning curve for my sound [department] because they’re used to the Michael Bay approach which is to make it as loud as you can as long as you can. NYC MOVIE GURU: What was your favorite moment from your experience of directing The Mist? NYC MOVIE GURU: What does it say about the audience when they cheer when Mrs.Carmody gets shot and killed? FD: What that says about the audience is that we hate extremists and we all want them shot. I say, let’s round them up and kill them all. [laughs] We’ve stumbled upon a truth here. I expected a level of catharsis, but what I didn’t expect was how much people grew to hate her. It’s more than what’s onscreen—it’s what’s all around us. I think people are really sick of extremists. The reasonable people, who are always willing to have a conversation, are getting battered by these pricks. Whether it’s a political or religious form of extremism that exists, it’s an evil and destructive force which people are starting to sense that now.